After ten or so days of serious investigation and debate, Eileen and I bought a new 2008 Nissan Altima today to replace the blue Saturn. We originally bought the Saturn off the showroom floor ten years ago and it had been a really good car, but we expected to replace it later this year. Having to buy a car on short notice made it much more difficult though. After careful consideration, the Altima was the right combination of features vs. price. We got the 2.5 litre SL package in a dark metallic grey exterior with a black leather interior. The first car we drove was a 2009 Acura TSX and we found it to be a feature-rich car with excellent “sports sedan” appeal. A bit expensive though, for the features we really value. We also looked at pre-owned cars. I have nothing against a recent model pre-owned car but I never like buying privately (can’t be sure of what I’m getting) and dealer inventory is hit-or-miss. Since we didn’t have a lot of time our options were limited. We looked at a 2007 Lexus ES 350 and very seriously considered that car, right up until we realized that we aren’t (yet) Lexus people. Maybe our next car will be a Lexus: very plush, outstanding reputation and great finish. Hopefully people will think that of us if we are driving one! Another visit to the Infinity/Nissan dealer brought us to look at the Altima. I was initially skeptical but after a drive and a look at available options I changed my mind quickly. The 2.5 litre engine with the CVT transmission makes it quite responsive and we could get a huge list of features for a quite moderate price. Another strong contender was the 2008 Volkswagen Passat. Eileen is driving a 2003 Volkswagen Beetle convertible and loves it, and our experience with the car and dealer has been excellent. However for the price was higher than the Altima for the similar features, so we just couldn’t bring ourselves to spend the extra money when it wasn’t necessary (e.g. the dealer isn’t that nice). We spent a while driving around in the Altima today and we are thrilled to own one. I think we are off to a great relationship with that car, not the least because the Bluetooth phone integration with voice command is so much fun to play with! I don’t think Eileen enjoyed the car shopping experience. 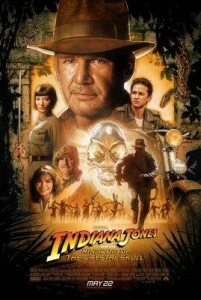 I wouldn’t say I enjoyed it but it was moderately entertaining and we met some really nice people along the way. Eileen and I went up to the Okanagan valley on our annual pilgrimage to the wine country of B.C. Every spring we go to visit old favorites and try the newer ventures. We had a fantastic long weekend, leaving home on Thursday and getting back on Sunday. The weather was really outstanding and the guest house at Burrowing Owl is very luxurious, enough so that it is easy to get relaxed in a matter of hours rather than the typical days of decompression it might take on any other holiday. Our return trip this morning started off with very unusual weather: rain! Good thing we had decided to head out early such that we could pick up the dogs from their “spa weekend” on the way home. Unfortunately things didn’t go as planned: on one of the sharp turns outside of Princeton a car crossed the center line and smashed into the driver’s side door of our blue Saturn. The picture pretty much says it all. Fortunately no one seems to have been injured, and the story ends better than it might have. It is a bit weird having an accident outside any major population center; there was no cell service for anyone’s phone and there was limited traffic passing by (although all who did pass stopped to see if they could help). We packed ourselves up and headed back 20km to Princeton to find the local RCMP detachment and look into how we might want to get our car back to Vancouver. Princeton isn’t exactly a major destination spot in B.C. One tow truck service, no car rental options, and quite limited choices for pretty much everything else. We stopped at the Husky gas station as it was the first place we came to, though the staff was moderately unhelpful. We got cell service and started calling around to the RCMP to report the accident. Someone else had already reported it however, which explained the police, ambulance and fire rescue service vehicles we passed on the way back to town. I guess they weren’t taking any chances on whether we were lying a pool of our own blood and body parts, potentially pinned under a blazing car. Better safe than sorry, which is fine by me. The only downside was that we had to wait while they got out to the site, concluded there wasn’t anyone to rescue, then drove back to town to interview everyone involved. After some waiting, then some explaining, then more waiting, we were handed our police report and sent off on our way. During part of the waiting we occupied ourselves with talking about how lucky we’d been and also trying to recollect whether we thought our car was too badly damaged to drive or not. 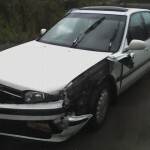 The impact was low speed and from the side such that our airbags did not deploy. I recalled kicking open the door to get out, while Eileen’s door was pinned against the concrete barrier that protected us from driving off the road to relative safety. We weren’t really sure whether there had been damage to the wheels or not. We got a tow truck to take us back out to the scene and investigate whether our day was going to get much, much longer. Turns out with a sharp kick to force the door securely closed, careful removal of the debris from what was left of the door, and some duct tape to secure the remaining dangling plastic fragments we could drive the car safely enough to get back to Vancouver. All in all, we were amazingly lucky. I’m very impressed with the way our Saturn weathered the damage, but I wouldn’t want to try it again. 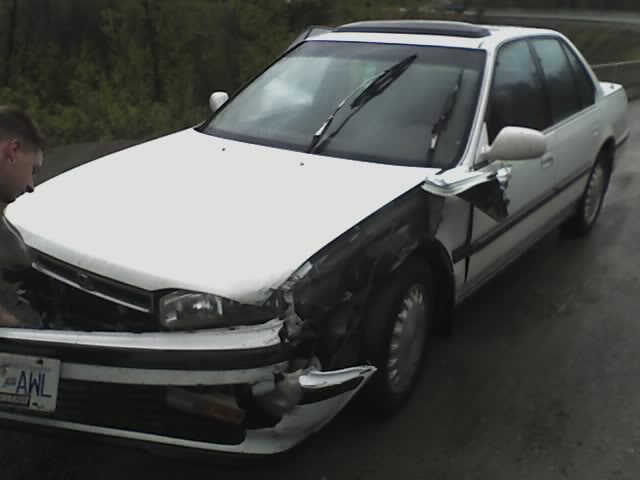 The white Honda Accord that hit us didn’t hold up nearly as well, tearing away the front quarter panel and front bumper. 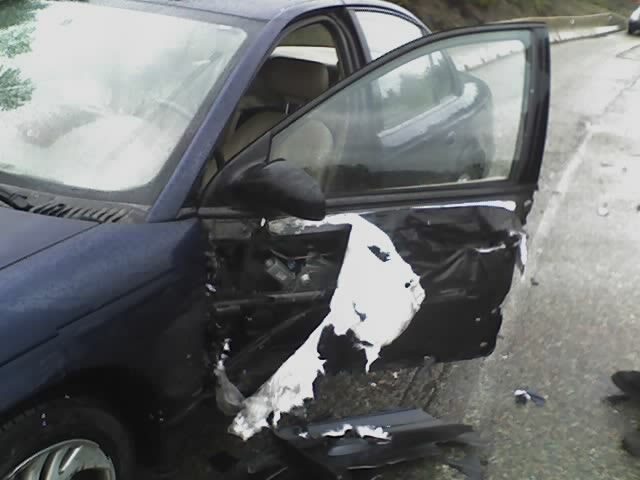 Besides not sustaining any injury and only moderate damage, the other good thing is that our six cases of wine in the trunk were not damaged at all. Whew.